An article in the research journal Nature by the incoming executive director of the Global Institute for Water Security (GIWS) reveals the dramatic impact of climate change and human activities on the availability of freshwater around the globe. SASKATOON – “With a changing climate, the increasing severity of flooding and drought, and unsustainable use of groundwater to meet increased food production demands due to population growth, the world’s freshwater resources are under a level of stress unseen before,” said Jay Famiglietti, senior water scientist at the NASA Jet Propulsion Laboratory at the California Institute of Technology. Famiglietti, the paper’s senior writer, was recently named U of S Canada 150 Research Chair in Hydrology and Remote Sensing, and will join GIWS effective July 1. The Nature article, published online today, is based on an unprecedented level of data gathered using NASA’s Gravity Recovery and Climate Experiment (GRACE) satellites, other satellites and traditional sources. In this first-of-its-kind study, the authors relied heavily on observations by the GRACE mission of terrestrial water storage. The result is a startling new global map that depicts changing freshwater availability during the 2002-2016 period. “Our study points to a distinctive, underlying pattern of the mid-latitude areas of the world getting dryer, while the bordering tropical and high latitude areas are getting wetter,” said Famiglietti. Embedded within this pattern are 34 major global hotspots where freshwater storage has changed over the 14-year study period, two-thirds (23) of which have been, or probably been, caused by global change or human water management. A majority of the hotspots (19) are losing water rapidly because of excessive groundwater pumping, or the melting of ice sheets or glaciers. The key environmental challenge of this century could be globally sustainable water resources management, said the authors, noting a recent study that estimates five billion of the global population of 7.6 billion people live in areas where water security is at risk. Famiglietti and his former doctoral student Matt Rodell, first author of the study, pioneered the use of the novel GRACE satellites to identify and quantify groundwater depletion from the globe’s major aquifers. Rodell is now chief of the Hydrological Sciences Laboratory at NASA’s Goddard Space Flight Center in Greenbelt, Md. An issue for Western Canada will be decreasing replenishment of water supplies in aquifers and reservoirs, as glaciers and snowpack in British Columbia disappear, Famiglietti said. Figure 1: Trends in TWS (in centimetres per year) obtained on the basis of GRACE observations from April 2002 to March 2016. The cause of the trend in each outlined study region is briefly explained and colour-coded by category. The trend map was smoothed with a 150-km-radius Gaussian filter for the purpose of visualization; however, all calculations were performed at the native 3° resolution of the data product. Glaciers of the Canadian Archipelago, west of Greenland, are also melting rapidly. This is against a backdrop of increasing water storage in much of Canada’s higher northern latitudes. Canada’s sub-Arctic lakes are vulnerable to drying as snowcover and permafrost decline. The recent bouts of drying may be unprecedented in the past 200 years, according to the paper. A wetting trend in the northern Great Plains of southern Canada and the U.S. is likely the result of a prolonged period of higher-than-average precipitation and flooding, said the authors. Along with Rodell, two other team members are Famiglietti’s former PhD students. John Reager is a research scientist at the Jet Propulsion Laboratory, and Min-Hui Lo is an atmospheric sciences professor at National Taiwan University. During the study period, all but one of the 34 regions lost or gained more than 32 billion cubic metres of water. For context, that’s more water than is contained in Lake Mead near Las Vegas, the largest human-made U.S. reservoir. Eleven regions lost or gained more than 10 times that volume. The team supplemented GRACE information with U. S. Geological Survey Landsat imagery, observed changes in lake water levels, and data from sources such as published reports of human activities involving irrigation, mining, reservoir operations and inter-basin water transfers. Across the globe, co-operation among nations and stakeholders will be needed to balance competing demands in regions affected by declines in water supplies,according to the authors. For instance, avoiding potential conflicts will require the inclusion of groundwater sharing in transboundary agreements. “The need for water-saving technologies and improved management and governance of water will become increasingly clear, and will be essential to future water and food security,” said the authors. 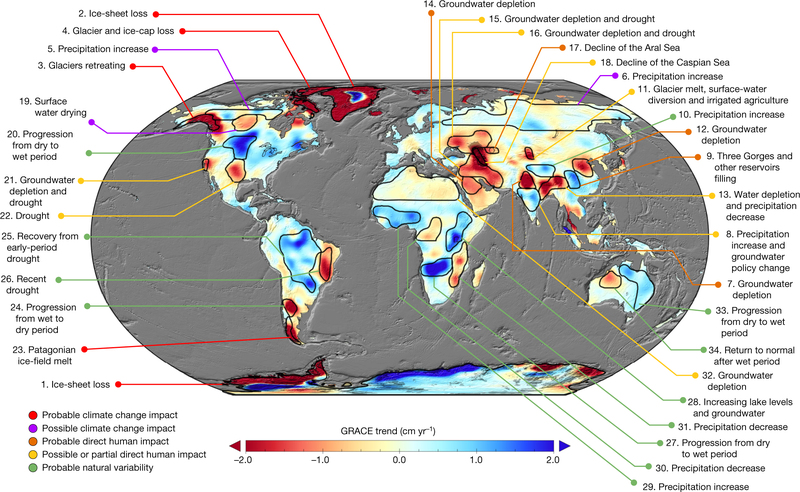 Between 2002 and 2016, the Gravity Recovery and Climate Experiment (GRACE) tracked the movement of freshwater around the planet.